Veteran blogger and prominent radio host Mark Lopez burned Rappler anew for spreading fake news that taking photos and videos during Maria Ressa's arrest which was streamed live on social media. Rappler's Twitter account posted information on social media about the arrest of Maria Ressa but with a twisted message as they stated that a member of the Rappler team was not allegedly allowed to take videos but the statement was contrary to what's happened during the incident. Rappler tweeted "An arrest warrant vs. Rappler CEO Maria Ressa being served inside the Rappler office now. Officer part of the serving party prohibits reporters from taking videos. He says he's part of the NBA. The statement of Rappler on Twitter caught the attention of Mar Lopez who responded to the tweet lecturing Rappler. 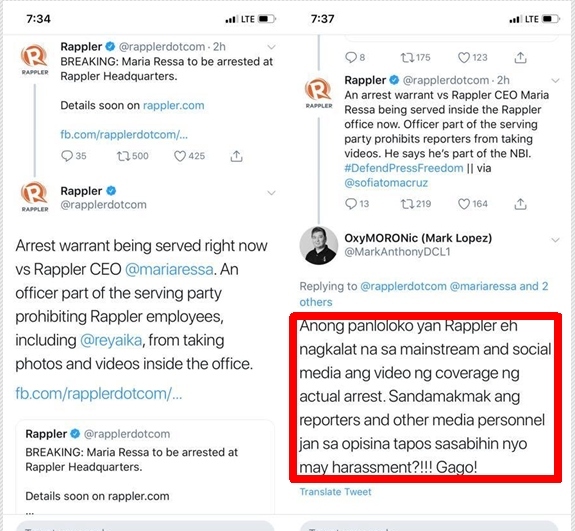 Mark Lopez tweeted "Anong panloloko yan Rppler yan Rappler eh nagkalat na sa mainstream and social media ang video ng coverage ng actual arrest. Sandamamak and reporters and other media personnel jan sa opisina tapos sabihin nyo may harassment?!!! Gago!" The veteran blogger also posted the following message on social media to let the people knew what really happened during the arrest of Maria Ressa. Tarantado talaga itong mga taga Rappler at nuknukan ng sinungaling! Dapat lang talaga ipasara na kayo!